Thank you to all of our students, faculty and staff and the representatives of PetCo who helped us gather over 150lbs of donations for the OC Animal Care Center and Irvine Animal Center. As part of our REACH Beyond the Classroom Service Learning and Civic Engagement initiative, Stanbridge College hosted a week long fundraiser benefiting the Orange County Animal Care Center. 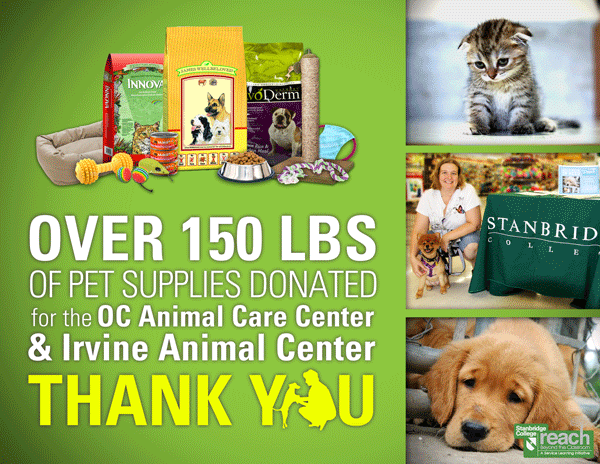 On Sunday, August 21, 2011 Stanbridge partnered with PetCo in Irvine to run a second fundraiser to benefit the Irvine Animal Shelter. Students, staff and faculty volunteered their time to gather donations of pet food, kennel supplies, animal collars, blankets and other items for the animal shelters.